Located in the Basque country of northern Spain, with 43 rooms, a huge Caudalie Vinotherapie spa, and a 150-seat restaurant, this is the perfect place for wine lovers. It is adjacent to the 148-year-old Herederos del Marqués de Riscal winery. 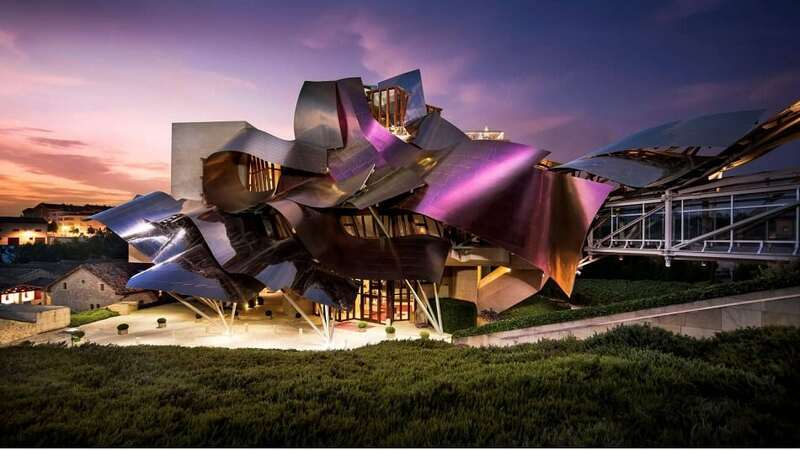 The hotel was designed by the legendary Frank Gehry – and it is his first.Most notably the roof is pink and made of titanium; the entire complex reflects Gehry’s original themes. This is a contemporary, luxury retreat with unique artwork on display. The lush landscape, the incredible architecture and the delicious food all combine to create a once-in-a-lifetime experience in The City of Wine.